UNC chemistry professor Wenbin Lin has developed an ultra-porous metal-organic framework (MOF) that can extract uranium from seawater at a cost that may become competitive with conventional uranium mining. In an effort to ensure an abundant supply of uranium to fuel nuclear reactors, scientists had been seeking ways to extract it from the oceans which, they estimate, contains about a thousand times as much as known reserves on land. The current technique for seawater extraction uses plastic fibers coated with uranium-binding chemical groups. Lin’s UNC Chapel Hill materials research group has designed a metal-organic framework (MOF) that, in lab tests, have proven to be at least four times more efficient at attracting uranium from seawater than plastic adsorbents. The main reason is that MOF structures can be precisely tuned for specific materials, allowing their porosity to be an order of magnitude higher than that of the zeolites currently used in commercial absorbents. Still the concentration of uranium in seawater is only about three parts per billion. The current seawater uranium extraction method calls for large amounts of plastic adsorbents to be dropped into the ocean and left for several weeks. When they are hauled back up, they have absorbed only about three to four miligrams of uranium for each gram of plastic. The yield is reduced due to the existence of many other ions that can bind to the absorbent, blocking uranium from attaching. Lin believes that his MOF absorbents can do much better due to their greater porosity and their tunability to absorb mostly uranium-containing ions and not other competing ions. So far in lab tests his material has absorbed 200 miligrams of uranium per gram of absorbent — about fifty times more than currently used plastic absorbents, according to a study published in the Royal Chemical Society’s journal Chemical Science. If Lin is able to obtain similar results at scale under real-world conditions in seawater he could bring down the cost of uranium extracted from seawater to as low as $50-$100 per kilogram — about half the going price of conventionally mined uranium. The cost of extracting uranium from seawater using today’s plastic absorbents is about $1,000 to $2,000 per kilogram. Lin graduated with a BS in chemical physics from China’s University of Science and Technology and earned a PhD in chemistry from the University of Illinois at Urbana Champaign. He won a National Science Foundation postdoctoral fellowship at Northwestern University before joining the faculty at Brandeis University in 1997. He moved to Chapel Hill in 2001. He has been a full professor there since 2007. 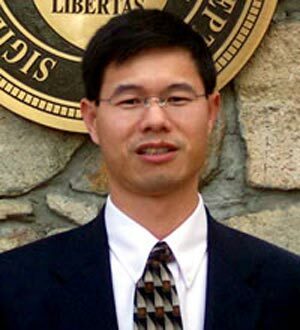 UNC Chapel Hill professor Wenbin Lin has developed a potentially cost-efficient way to extract uranium from seawater.